Chinese solar PV manufacturing giant JinkoSolar has been confirmed as the world’s leading solar PV module supplier according to new figures released by leading data and analytics firm GlobalData, accounting for nearly 10% of the global market share and shipping 9.70 gigawatts (GW) of PV in 2017. 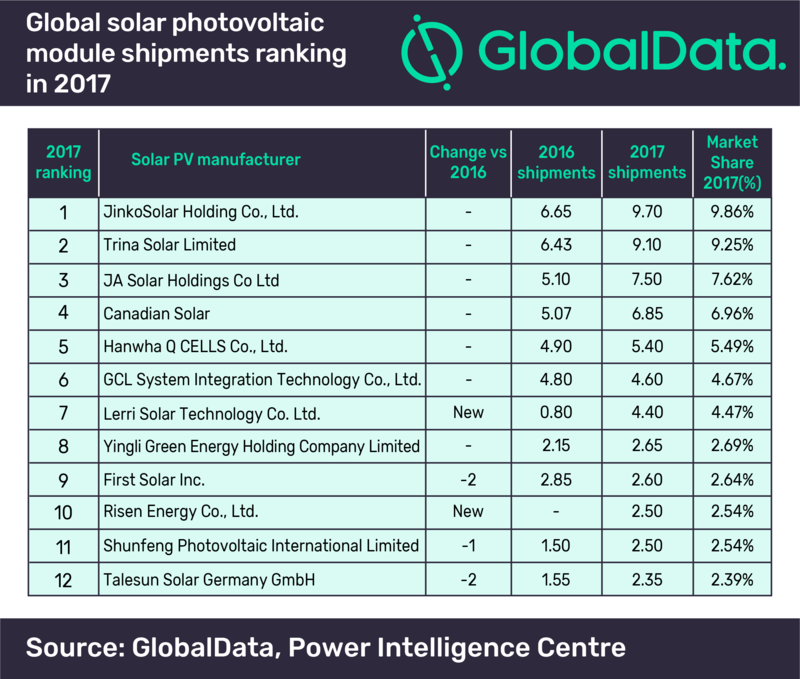 GlobalData published its global solar photovoltaic module shipments ranking for 2017 late last week, highlighting JinkoSolar’s second year atop the pile with shipments of 9.7 GW for 2017. The company ranked ahead of Chinese Trina Solar which shipped 9.10 GW in 2017 and Shanghai-based JA Solar, which shipped 7.50 GW. In fact, just over a month ago, JinkoSolar published its financial results for 2017 and showed off its mammoth solar shipments for the year, which the company actually pegged at 9,807 megawatts (MW). What is most impressive, however — despite the obvious — was the progression the company’s expectations made throughout the year. Early in 2017, the company announced that it had shipped 6.65 GW worth of solar modules in 2016 — again, only just beating out Trina Solar. At the beginning of 2017, therefore, JinkoSolar provided guidance that it expected to ship between 8.5 GW and 9.0 GW, a figure it then increased in December to between 9.6 GW and 9.8 GW. Overall, GlobalData placed the value of the global solar PV module market at $36.71 billion in 2017, a figure which is actually expected to decrease over the next few years, down to $26.4 billion in 2021. This might sound like bad news, but as we have seen over the last year or two, decreasing market value does not necessarily translate into decreasing market size. Rather, GlobalData expects the fall in market value to be attributed primarily to the fall in module prices. JinkoSolar’s stellar 2017 is likely to put it in a strong position to lead through 2018 as well, but the other companies on GlobalData’s list are in a similarly strong position. Trina Solar is also well-placed with strong product quality and reliability, performance, and innovation. As for the rest of GlobalData’s list, Ankit Mathur says: “Lerri Solar Technology Co. Ltd., a subsidiary of LONGi Green Energy Technology, gained substantial ground by entering into the top solar manufacturer ranking in 2017. The company is planning to raise its stakes in the growing market through rapid expansion in domestic and overseas manufacturing facilities. Recently the company announced its plan to increase its production base with a set up 1 GW Mono Cell and 1 GW Mono Module Manufacturing Facility in India.